Last week, at an overlook near Smithers, British Columbia I came upon one of my favorite quotes on a plaque laid in memory of Eric Paul Buss, a mountaineer killed here in 1991 at age 40, in an avalanche. Reading those familiar words, in that beautiful setting brought me to tears. I placed my hand over my heart and recited the plaque aloud, as a benediction, a pledge and a prayer. Dio scenting the waterfall wind. After renewing my vows at the Mallory plaque, I headed up the mountain on the rocky, rooty, relentless steep Glacier Gulch trail. Given a choice between a flat, easy stroll and a leg and lung-busting climb, I’ll always take the climb. 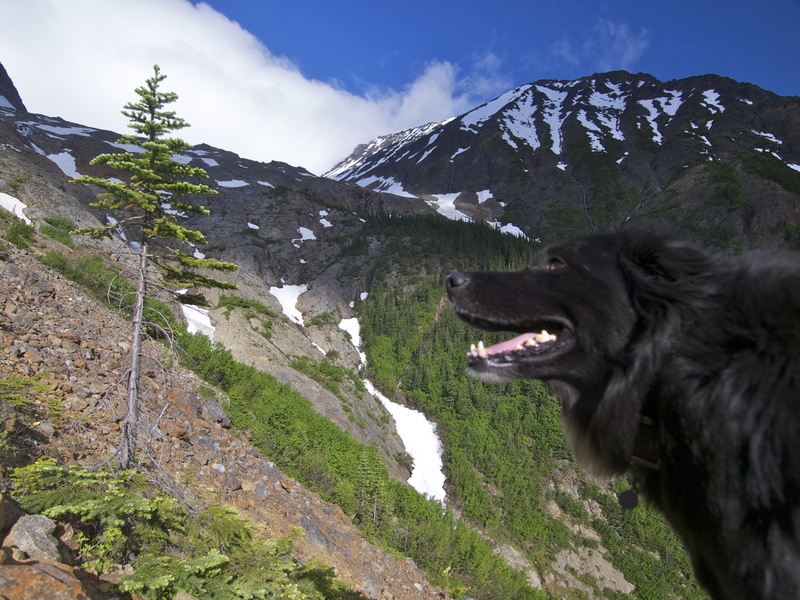 I am not a particularly fast hiker, I stop often to look and take photos and seldom pass up a good sitting spot, but after more than a decade of daily hikes, I am a consummately strong hiker. As the miles unfurl over rough terrain, I am often the last man standing and always the last still grinning. Climbing up through Glacier Gulch, I see why this is deadly avalanche terrain. The slope is close to the angle of repose; shallow enough to allow snow to accumulate, but steep enough that it occasionally violently sheds a layer. The narrow gulch funnels the fall into a fury; snapped trees bear testament to the inescapable power of snow, ice and gravity. Eric Paul Buss, rest in peace. 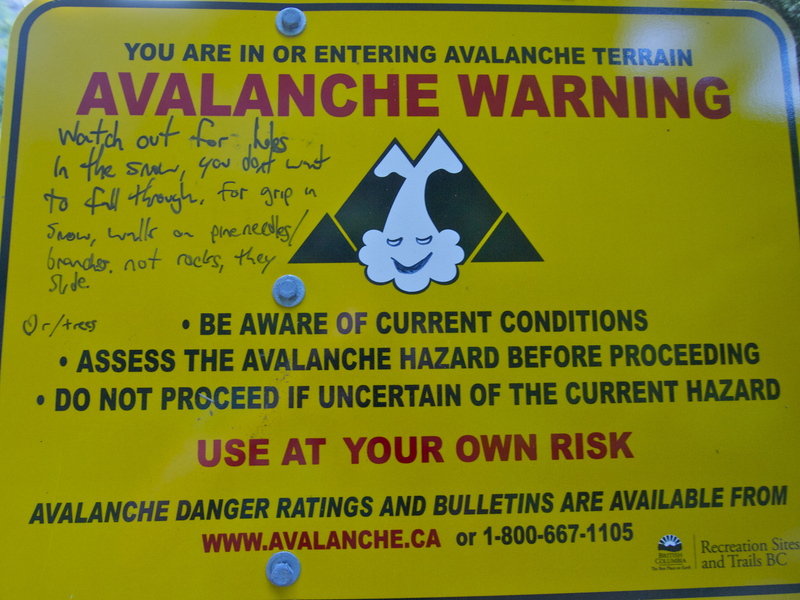 Avalanche Warning Sign on the Glacier Gulch Trail. No danger this time of year. 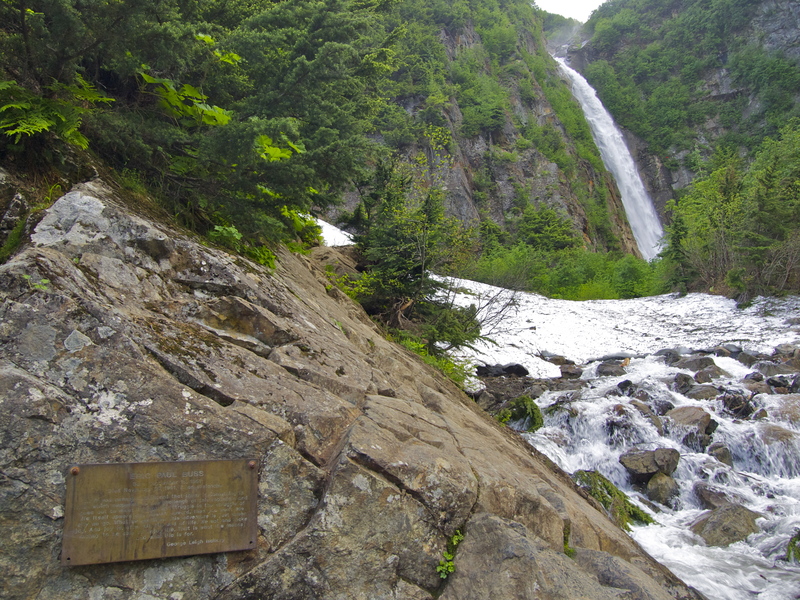 In mid-July, the avalanche danger is over. The slope still holds snow, but it’s all firmly crusted in place. 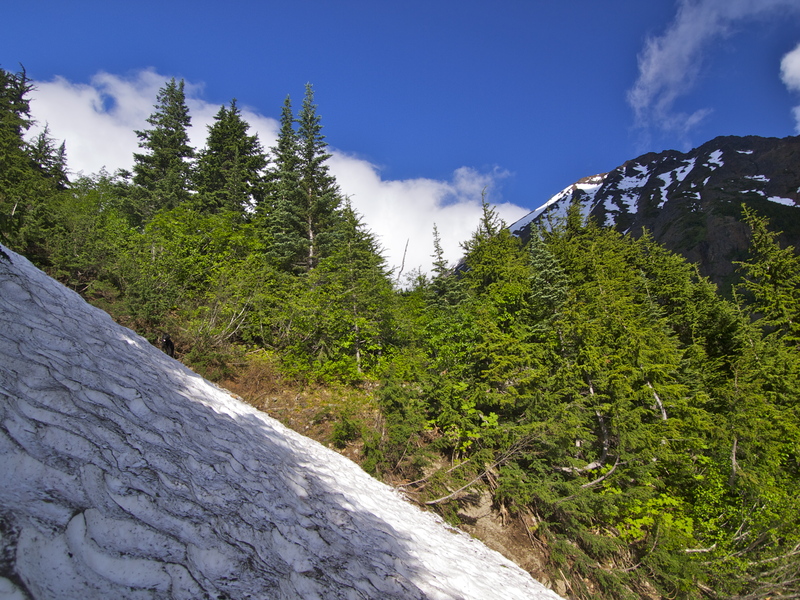 Partway up the trail, I come to a steep snowfield and know I should turn back; if I slip while crossing, I’ll plunge down slope into the trees. This is the second time in a week now I’ve wished for an ice axe. Then Dio bounds right across, following a shallow set of steps cut into the snow by some past mountaineer and I before I can talk my feet out of following, I’m halfway across, planting each step deliberately, my eyes never ranging further from my next foot placement. Step by step, my universe is reduced to one moment, one movement at a time. And then I’m free. 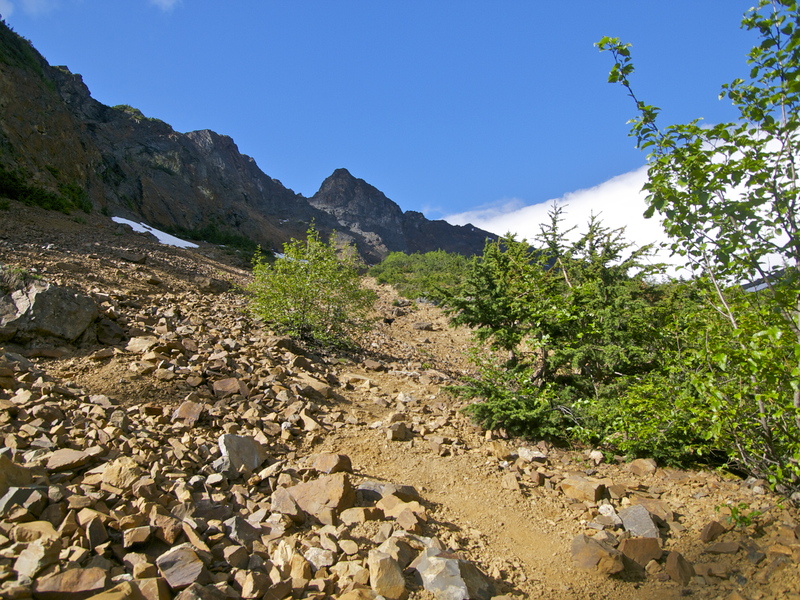 The trail nears treeline, and the rocks underfoot get bigger, just the right size now to roll. 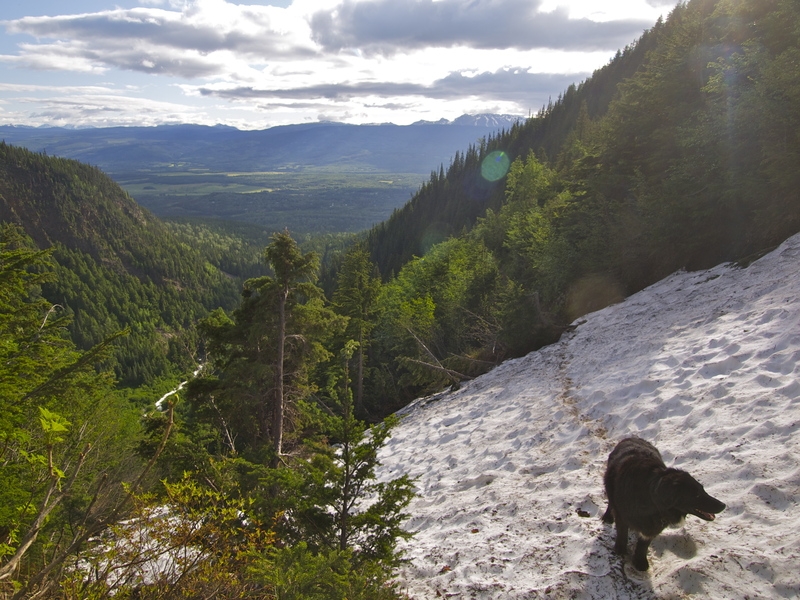 I send both dogs ahead of me and wait out of their fall line to avoid a loose rock to the head. Then I follow them up, sliding down a few inches for every foot gained, kicking skeins of loose rocks down slope in my wake. Controlled forward motion takes balance, timing and every ounce of strength stored in my mountain legs. The climb is getting dicey and I know it’s time to stop. Ahead, I spy a good sitting spot: a good-sized flat-topped boulder. As good a place to stop as any. I make my way there, unshoulder my day pack and wedge it against some rocks so it won’t roll down the mountain, grab my water bottle, and a granola bar and stake my claim on the boulder. Bowie soon joins me; Dio is halfway up the mountain. 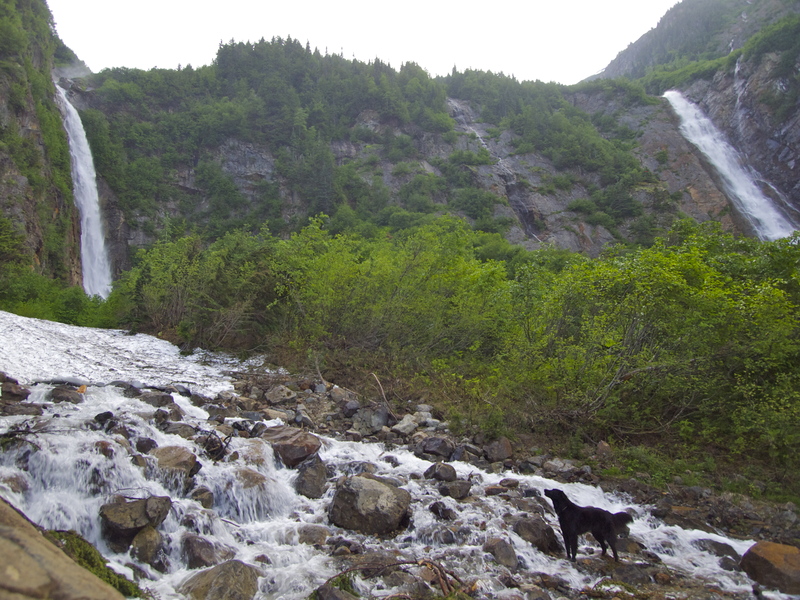 From here I can see the top of both waterfalls and the bottom of the glacier that feeds them. The breeze flowing down the mountain smells like blue ice and has a bite, but combined with the warm alpine sunshine, the spot is heaven on Earth. I sit, not thinking of the exhausting climb up or the upcoming precarious slide down, only of the exquisite combination of glacial breeze and alpine sun on my upturned face. Across all space and time and fantastic chance, my life has led to this heavenly moment in this spectacular place and it is indeed sheer joy. Amen, Mallory, this is what life means and what life is for. Sharing a sitting spot in the sun with Bowie, one of the great joys of life. That was tremendous. I don’t know how your legs do it, but I’m so glad they got you to that rock so I too could share Mallory’s view of life. Marvelous! Truly marvelous. Wish i had the third of your energy, would do me a grate deal of good. I just nominated u for the the best blog award, please come and collect. The picture of Bowie is wonderful. The open-hearted way you meet and celebrate nature and adventure is a joy to see. Your pictures and attitudes inspire me and, I suspect, everyone else who reads your blog. Keep living your life for joy.